Actor and comedian Tracy Morgan and two members of his entourage remained in critical condition Sunday, following a six-vehicle crash a day earlier along the New Jersey Turnpike that killed Morgan's mentor and fellow comedian. The 45-year-old former "Saturday Night Live" and "30 Rock" cast member was on his way back from a stand-up show in Delaware early Saturday with six others when a Walmart tractor-trailer struck their limo bus, causing it to overturn, New Jersey State Police confirmed. The crash, which happened about 15 miles north of Trenton near Exit 7A of the Turnpike in Cranbury, N.J. at around 1 a.m., killed Morgan's mentor James "Jimmy Mack" McNair, 62, of Peekskill, New York. The tractor-trailer driver, Kevin Roper, 35, of Jonesboro, Georgia, was charged with one count of death by auto and four counts of assault by auto, Middlesex County Prosecutor’s Office said in a news release. Roper, accompanied by his attorney, turned himself in to state police. He was released on $50,000 bail Saturday night, Wal-Mart spokesman David Tovar said Sunday. Roper is expected to appear in a Middlesex County courtroom Monday, according to prosecutors. Some early reports indicated the big rig driver was sleeping at the wheel, but New Jersey State Police say there is nothing to suggest he dozed off. "There is nothing that indicates that," said New Jersey State Police Sgt. First Class Gregory Williams. "There is no documentation that agrees with that." Walmart U.S. President and CEO Bill Simon expressed his condolences for the crash victims and their families in a statement to the press. "This is a tragedy and we are profoundly sorry that one of our trucks was involved," Simon said. "We are working quickly to understand what happened and are cooperating fully with law enforcement to aid their investigation." "The facts are continuing to unfold," he continued. "If it's determined that our truck caused the accident, Walmart will take full responsibility." A preliminary state police investigation found that the tractor-trailer came upon slow moving traffic and slammed into the limo. "The driver of the tractor-trailer ...failed to observe the slow moving traffic ahead of him," Williams said. "The driver did observe the traffic, but it was too late. It was just prior to impact, he swerved to the left in an attempt to avoid the collision. But he was unable to." The black Mercedes limo bus rotated clockwise, overturned on its left side and crashed into several other vehicles, he said. Six vehicles in all -- two big rigs, the limo bus, an SUV and two cars -- were involved. The crash was so severe, part of the limo's rear driver side was ripped away. Morgan's representative, Lewis Kay, told NBC News Saturday the actor is expected to remain in critical condition for the time being. "His family is now with him and he is receiving excellent care. We don't anticipate much of a change in his condition today but will provide a further update once more information becomes available," Kay said. McNair, who was killed in the crash, was a comedian who performed under the stage name "Jimmy Mack." McNair was a close friend and mentor to Morgan, Morgan's ex-wife, Sabina Morgan, told the New York Daily News. "He was one of the first comedians that took Tracy under his wing," she said. "They were very close." All of the injured were on the limo bus. One of the two drivers in the limo bus, 44-year-old Tyrone Gale of Rehoboth, Delaware, was visibly shaken while exiting Beebe Healthcare in Lewes, Delaware. Gale expressed his condolences for everyone involved in the accident before becoming overwhelmed by emotion and ending the interview. Christopher Thompson, co-owner of limo operator Atlantic Transportation Services, said the eight passenger limo bus had another driver besides Gail on board. One was behind the wheel and another in the front passenger seat. The second driver also suffered non-life-threatening injuries and was shaken up by the crash, Thompson said. "Atlantic Transportation Services extends our heartfelt thoughts and prayers to those injured in last night's accident. We also give our sincerest condolences to the family and loved ones of the one individual that passed," he said in a written statement. "This is a very difficult time and we appreciate all of the support and well wishes we have received thus far, and we ask that everyone pray for the recovery of those injured. Godspeed to all involved." Morgan had a scheduled performance at Dover Downs Casino in Dover, Delaware, on Friday night. That's about 120 miles south of the crash point. The bus was chartered by the casino, according to Thompson. Fuqua posted a photo to Instagram around midnight showing Morgan in front of a crowd. His Facebook page said he was opening for Morgan. "This is what it looks like from the stage to see a standing ovation from 1,500 people," the photo's caption read. "Then we traveled back to NYC in style in a luxury Mercedes Sprinter. Road life is a good life!" PHOTO: The aftermath of the crash showing the overturned limo bus. A New York City native, Morgan started as a cast member on "SNL" in 1996 and spent seven years on the show. He later had his own show, "The Tracy Morgan Show," which lasted for just a season. 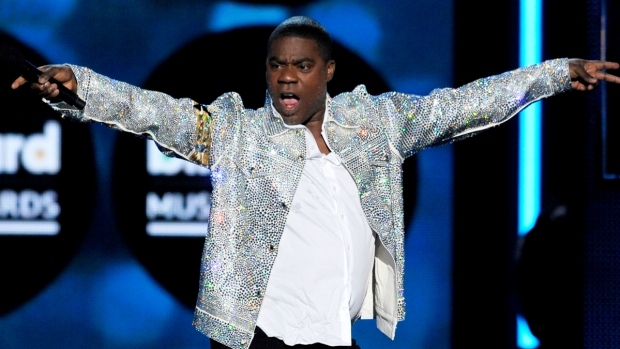 In 2006, he portrayed the role of Tracy Jordan in the hit NBC comedy "30 Rock," created by "SNL" co-star Tina Fey. He once called his gift for being funny "a defense mechanism" for his miserable circumstances. As a teen, he started doing comedy on the streets to supplement the family's welfare income. In recent years, he has struggled with alcoholism and has been arrested on drunken driving charges. He had a successful kidney transplant in late 2010. The National Transportation Safety Board investigators on Sunday were working with state police to look at any issues in the crash related to commercial trucking and limousine safety, officials told NBC10.com.